I have never been Suzy Homemaker. It's just not me. But a few months ago, I decided to make a change and try to eat healthier which means cooking at home, cooking from scratch. One thing I can do is read a recipe and I read a lot. I even follow a few. But following the recipe and making it look easy like Martha ain't happening. I just don't have the staff to prepare the ingredients nor clean up after me. So this is what it looked like after our simple Christmas meal of "Boston Market" chicken, Vermont cheddar mashed potatoes and green bean casserole. I used no cans of soups, no mixes and it smelled and tasted so good. But it sure is a lot of work. I think I prefer baking to cooking. 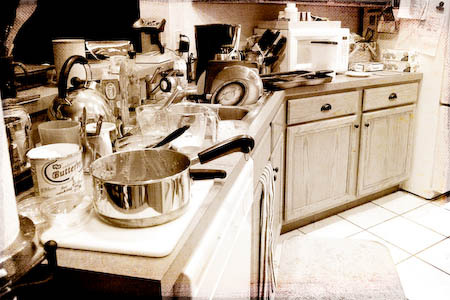 There is time to breathe and clean up as you go while the item is baking. And, I just don't have the courage to show the pan I scorched because multi-tasking in the kitchen is more dangerous than talking on the cell phone and driving.